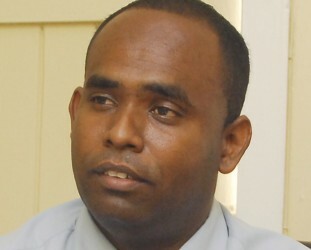 The police, through increased patrols, roadblocks, raids and other crime fighting initiatives, have successfully managed to keep gun-related crimes down, according to Crime Chief Wendell Blanhum who said yesterday that the type of robberies being reported in the media has created an impression that there is an increase in crime. “There are isolated cases which are being glamorized… and that gives the perception that there is an increase but then the stats tell you a different story…,” he told Stabroek News when asked for a reaction to the apparent increase in crimes. There have been several gun-related crimes in the past few weeks which have left persons either injured or dead. Citing figures to substantiate that ranks have been making progress in the crime fight, Blanhum said there has been a 10% reduction in gun robberies at the end of June when compared with the same period last year. Robbery under arms with other instruments such as a knife has seen a reduction of 2% thus far, he said adding that there has been a 56% increase in firearms seized as of yesterday when compared with the same period last year. Sixty-one illegal firearms have so far been seized in comparison with the 31 for the January to June period last year. He said that all the divisions have intensified their crime-fighting efforts over the last two weeks which have seen an increase in roadblocks, raids, intelligence-based operations and mobile patrols. He said that during this period “known characters” have been arrested and questioned. According to the crime chief, he regularly meets the divisional detective officers to discuss the crime situation and similar meetings would have taken place between them and the senior management of the Force. While not wanting to give out too many details on the strategies being implemented, he stressed that road blocks in all the divisions have been increased and he noted that up to Friday ranks recovered a quantity of stolen articles and weapons. Among the weapons seized he said is one at Light and Cummings streets during this week and another at the GGMC mining station in Mahaica. He said that some persons who were wanted for robbery under arms were arrested as a result of some of these crime-fighting initiatives and have since been charged. Updating Stabroek News on the recent shooting to death of Rubis accountant Jason Cort, Blanhum said ranks recently received some CCTV footage which would be helpful to the investigation. “The detectives are currently reviewing the images with the hopes of trying to identify the perpetrator,” he said. Cort, 27, was confronted by a gunman soon after he entered his Meadow Brook Gardens home last Wednesday night and was fatally shot to the chest. Asked about the motive for the killing, he said it is being investigated as a robbery as items are missing. The man’s licensed firearm, a sum of cash, an XBOX console, Samsung Galaxy phone and a gold chain and a bracelet worth $500,000 are said to be missing. Blanhum said that in relation to the shooting of ex-policeman Ravi Outar, police are still looking for the shooter. Outar was shot on the night of June 10 and succumbed to his injuries on Friday. He said the police will now need to seek legal advice relative to Jamaican Ralvin Mc Lean who was last week charged with attempted murder. Mc Lean is said to be the person who drove the gunman to the scene. Blanhum told Stabroek News that it is likely that Mc Lean, who is on remand, will be recharged with the capital offence. Reports are that Outar was sitting in his business place at Rose Hall when a lone gunman walked up to him and opened fire. He was rushed to the New Amsterdam Hospital with about five gunshot wounds and transferred to the Georgetown Public Hospital, where he died. Outar and Mc Lean were known to each other. He informed that police have since received credible information and are looking for two suspects in the armed robbery committed on Reginald Manbodh. The 67-year-old man was shot at least thrice during the robbery which occurred outside his South Ruimveldt home on Thursday. He had just returned home from the bank where he had withdrawn $2 million. 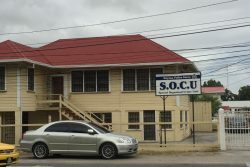 A relative told Stabroek News yesterday that the man underwent a successful surgery last Friday night and is currently being monitored by doctors. Last month, Mahaica rice farmer Hardat Kissoon was shot dead as he attempted to hold onto a bag containing just over half a million dollars. He was in a minibus heading home with his cash after changing a cheque at a city bank. Blanhum said too that police managed to capture a gunman in the Diamond Housing Scheme area shortly after he and an accomplice committed an armed robbery. He said that quick response was as a direct result of an increase in police patrol in the area. He also said that on June 15 around 21:30 hrs at 7th Avenue, Diamond Housing Scheme two men, one of whom was armed with a handgun robbed a taxi driver. The man raised an alarm and the police responded and encountered gunfire from the fleeing men. One was later captured while the other managed to escape. With regard to the Colin Kendall murder, Blanhum said that it is still being investigated. He revealed that a suspect, who was detained when he turned up to court for another matter, has since been released from police custody. Police had said that Kendall called “Bow” was sitting with a group of men under a shed at North Sophia on June 7 when a car drove up and a man armed with a firearm exited and discharged rounds in their direction. Kendall was hit about his body and was pronounced dead on arrival at the GPHC. Another man so far identified as “Keith” was hit to his left side and was admitted to hospital.